It sometimes happens that people lose all of their upper and lower teeth. This can happen for several reasons, including serious infection and physical trauma. Old age can also lead to the deterioration of teeth which necessitates their removal. Unfortunately, the absence of teeth will almost certainly make a person’s day-to-day life significantly more difficult. Simply eating foods will pose a challenge, not to mention the effects it can have on a person’s smile and their facial features. Fortunately, the team at East Bentleigh Dental Group can provide full mouth dental implants in Melbourne for patients of all ages. We can replace all of your damaged or missing teeth with implant-supported bridges and dentures. You can rely on us to deliver full jaw restorations that greatly improve your chewing function and meet your aesthetic expectations. Our extensive expertise and experience ensures you’ll receive the satisfaction and peace of mind you deserve. Before we begin the process of placing and integrating full dental implants, we conduct a comprehensive consultation to assess your condition and determine your eligibility. In addition, we can demonstrate models of the implant bridgework options that are available and formulate a personalised treatment plan that takes your specific requirements into account. Once your suitability for implant restoration has been confirmed, a dental surgeon can place the full arch implants into your jaw. The next 2 to 6 months are spent waiting for the implants and the bone to bond together. Temporary teeth replacement solutions are provided throughout this period so that you can continue day-to-day activities such as chewing and biting. Although some full mouth dental implants come with necessary connecting devices already attached, others need to be attached separately to complete the foundation for your new artificial teeth. A healing period of one or two weeks will follow this procedure. 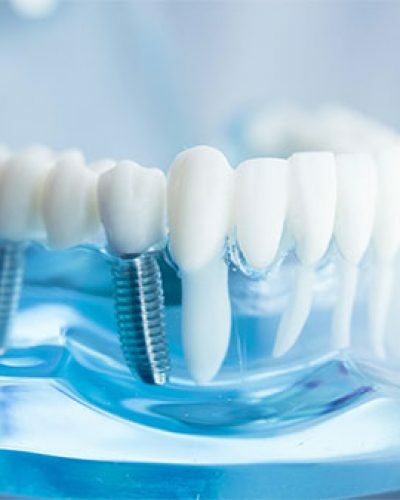 A dental implant bridge or full dentures will then be created and attached to the connecting device and your teeth will be restored. It’s important to ensure that your full arch dental implants are kept clean after they’ve been successfully integrated. We can provide helpful oral hygiene advice to help you keep your new implants clean and ensure they’re properly maintained. Brushing twice a day and flossing once a day will prevent bacteria from building up inside your mouth. This will maximise the longevity of your implants and help you avoid complications over time. There are several reasons why you should choose a full dental implant bridge over other replacement options. First and foremost, full mouth dental implants look and function just like natural teeth. This allows you to smile with confidence as well as chew foods without difficulty. By seamlessly integrating with your jawbone, they also replace some of your tooth roots, preserving the bone underneath. This helps you avoid a recession of the jawbone and an unattractive smile. East Bentleigh Dental Group is the number one choice for full mouth dental implants in Melbourne. Contact our dental clinic today for more information about our services.